[…] Usually, it takes the second-generation device for the graphics horsepower to catch up with all of those pixels. With an external display it would have to go through the Thunderbolt port. The amount of data required to drive that many pixels through a Thunderbolt cable is going to be difficult until Thunderbolt cables get faster (which is planned). I love my retina display on my MacBook Pro. Text is gorgeous. I could never see myself buying another non-retina screen Mac. This screen has ruined me. I will intentionally not look at the retina iMacs if/when they show up. – Nobody makes general-purpose LCD panels with that resolution today. “4K” panels are 3840×2160, but 5120×2880 is about 1.8 times the pixel count — a substantial increase. It’s the (exact) same ratio as the difference between the first 24” (1920×1200) and 30” (2560×1600) panels. Since 4K panels are just starting to become mass-produced and affordable to high-end computer buyers, available and affordable 5120×2880 displays are probably not imminent. – Almost twice as many pixels require almost twice the bandwidth to drive over a cable. Thunderbolt at 10 Gbit/s wasn’t fast enough to drive 4K, which needs about 16 Gbit/s. Thunderbolt 2 at 20 Gbit/s can drive 4K, but not 5120×2880, which needs 28 Gbit/s. The only promising standard on the horizon is DisplayPort 1.3 at 32 Gbit/s, but that spec is being finalized later in 2014, which means we’re probably still years away from anything supporting it. – Many GPUs haven’t been powerful enough to drive much at 4K resolution even if they could output it somehow, so 5120×2880 would be out of the question. Fortunately, that last one is no longer true at the high end. It’s just the first two holding us back now, but they’re also the slowest to change. I suspect that 5120×2880 on the desktop is still 2–3 years away. 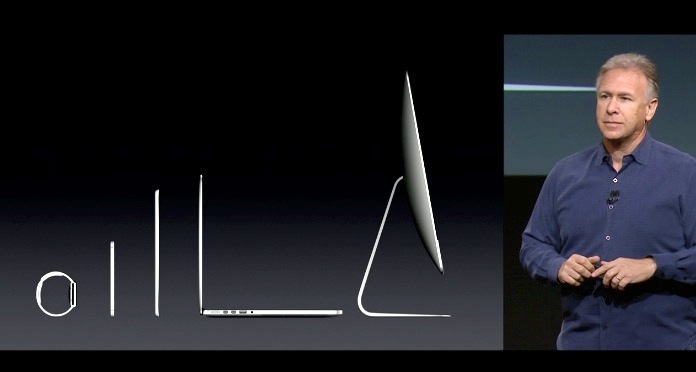 But I think Apple has already shown us how they’re going to do 27” Retina. Apple’s not a difficult company to predict if you pay attention. My hopes for a 5120×2880 display for the new Mac Pro were blinding me to the obvious clues to what will very likely happen instead. Before the 15” Retina MacBook Pro (the first Retina Mac), power users buying the 15” usually opted for the “high-resolution” option at 1680×1050 instead of the lower default of 1440×900. But when the 15” Retina MacBook Pro was released, its panel was a “2×” version of 1440×900 — a step down in logical resolution for power users. To make up for the loss, Apple introduced software scaling modes that simulated 1680×1050 and 1920×1200 by rendering them at double-size and then scaling the image down to the physical 2880×1800 pixels. GPU performance is reduced slightly, but otherwise, these higher-resolution scaling modes are effectively “free” — the pixels are so small that the reduced image quality from downsampling is barely noticeable. A few months later, the 13” Retina MacBook Pro was released with the same trick: a relatively low native resolution of 1280×800 logical pixels (2560×1600 physical pixels), but with simulated higher resolutions. To bring Retina to the 27” iMac and 27” Thunderbolt Display, Apple doesn’t need to wait until 5120×2880 panels are available. They can launch them at the next-lowest common resolution and use software scaling to let people simulate it if they want, or display things slightly larger at perfect native resolution. That next resolution down, of course, is 4K. The hardware and software to support 4K is already available. Thunderbolt 2 drives it well. Only very recent GPUs can drive it, but only very recent Macs with decent-to-powerful GPUs have Thunderbolt 2. All Apple needs to do to deliver desktop Retina is ship a 27” 4K Thunderbolt 2 monitor and enable the software scaling modes for it in an OS X update. We just learned that it’s possible to sell a 28” 4K display that’s at least halfway decent for only $700 and a 24” for $1300. With Apple’s supply chain, they could almost certainly sell a 27” 4K Thunderbolt 2 display for $999–$1299 now and a 27” Retina iMac later this year at pricing similar to today’s 27” iMac. I’ve gone back and forth on this, but I think both a Retina iMac and a Retina Thunderbolt 2 Display will be released in 2014.